If your Chihuahua has floppy ears and he's not a youngster, you have a pretty rare specimen. The vast majority of mature purebred Chihuahuas sport "prick ears," but baby Chis do not. Although the American Kennel Club's breed standard specifies stiff ears, rare Chihuahuas who have floppy rather than erect ears in adulthood do exist. Small chihuahua puppy on the grass. When Chihuahuas come out of the womb, their ears are floppy, confirms D. Caroline Coile in "The Chihuahua Handbook." Slowly but surely, their ears will become erect. Chihuahua puppies' ears typically start standing when they're around 3 months old. Every Chihuahua specimen is an individual; some take longer than others to acquire the signature prick ears. Many Chis experience a temporary ear droop shortly thereafter, when they begin getting their adult teeth. It's typical for Chihuahua puppies' ears to return to a floppy state when the teething process occurs. Chihuahuas generally begin to get their adult teeth around 4 months to 5 months of age; sometimes one ear will droop, sometimes both ears. Typically, ears that were coming erect before the adult teeth come in will stand again post-teething without any outside assistance. Some Chihuahuas require assistance in getting their ears to stand tall again, and their handlers or breeders will tape them in an erect position. The Chihuahua Club of America's president, Kyle Potts, uses foam hair rollers and athletic tape. Others use felt and tape; others, adhesive breathing strips. While Chihuahua puppies tend to have floppy ears temporarily, some members of the breed never develop prick ears. It's uncommon for adult purebred Chihuahuas to have floppy ears, but it happens. Among mixed-breed Chihuahuas, it's not uncommon for adults to have floppy ears. If a Chi has a Dachshund parent, for example, he's likely to have floppy ears. Because ears that don't stand erect are not in line with the American Kennel Club's Chihuahua breed standard, Chis with floppy ears are not permitted to participate in conformation dog shows. 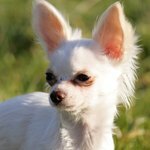 It is completely unnecessary for breeders to encourage standing ears in Chihuahuas who are at least 8 months of age, according to author Coile. If a Chihuahua's ears aren't standing by then, they'll likely remain floppy for his entire life. Chis with floppy ears are just like any other Chis, so you don't have to panic if yours is part of that category. Like all dogs with floppy ears, however, he might be particularly susceptible to ear infections.